First Chinese freights to northern France, French timetable changes, including line closures, closure threats in Thuringen. More train for Warszawa metro, more trams for Budapest and Belgium, metro open in Helsinki and Tbilisi. Whitcomb arrives in Netherlands, Wolsztyn Palndampf secured, new location for Padal train. David Haydock reveals some of the details of how Eurostar operates its winter weekend service form London to the French Alps. 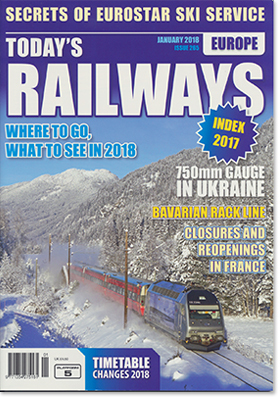 Andrew Thompson detail the fascinating history of a scenic rack line southern Germany. Mike Bent plots the history of a rural 750mm gauge network in Ukraine, while Duncan McEvoy describes a recent visit.